With the new DemoMate embeddable player, you can easily add your self-running tutorials into a SharePoint web part page, allowing you to quickly and easily provide tutorials to anyone in your organization. Adding a DemoMate tutorial to SharePoint is very straightforward. First, from DemoMate, select Package Tutorial. From the Packaged Tutorial Settings dialog, select the “Single File” option. 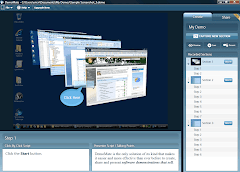 DemoMate will now open a folder and display your Silverlight .xap and .html files. Next, navigate to the document library where you want to publish your tutorial, and upload both the Silverlight .xap and the sample .html file. As soon as the upload has completed, copy the shortcut for the .html file associated with that tutorial. Now you can navigate to a SharePoint page, and embed the tutorial by adding a new Page Viewer Web Part to the page. You’ll need to customize the web part by specifying the URL for the .html file, which you copied in a previous step, and possibly adjusting the height and the width so that the Silverlight player fits perfectly. Using this method, you can quickly build up an entire document library of useful demos, training materials, or process documentation to share with your colleagues, partners, and customers.